(Ontario, Canada) The air travel industry is more competitive than it has ever been. As a result, many companies are offering new ways to increase the value customers receive. 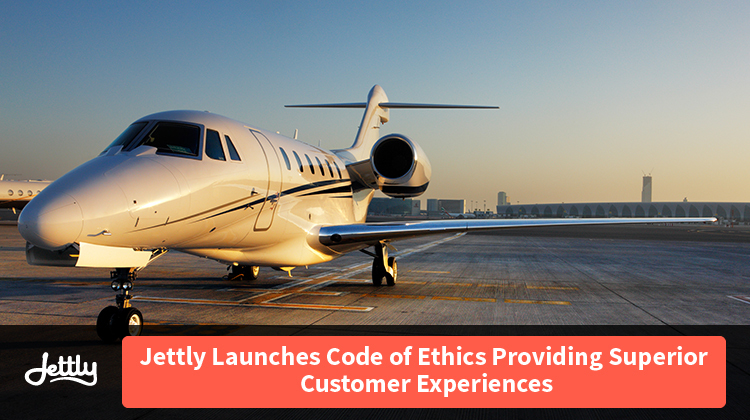 Jettly, an air travel company dedicated to superior customer experiences, has now introduced a new Code of Ethics to provide complete peace of mind. The mission of TICO is to help and promote an informed and fair marketplace where consumers can have confidence in the travel purchases they make. The organization supports the Ontario Ministry of Government and Consumer Services mission to keep an informed, safe and fair marketplace as it relates to the Travel Industry Act, which was put into effect in 2002. With the negative press many companies in the air travel industry are receiving lately, companies that are taking steps to improve the customer experience are standing out to customers. This new code of ethics adopted by Jettly lets customers see they are serious about ensuring their travel needs are met, with every air travel purchase made. Chartering a private jet now comes with a sense of security that wasn’t offered in the past thanks to the new Jettly guidelines. Jettly is a private jet charter brokerage that offers luxurious, quick and simple services to customers. The staff has made it their mission to deliver each of the three factors to each client served. As a leader in the private jet charter industry, Jettly offers web and mobile charter booking, along with end-to-end support. Regardless if someone needs to fly somewhere on very short notice for business purposes, or they have planned a trip for months, Jettly can provide the private charter services that each person needs and deserves. Jettly offers exceptional customer service and promises to provide exceptional air travel experiences.